I hope you are all staying nice and toasty on this very wet Friday afternoon. 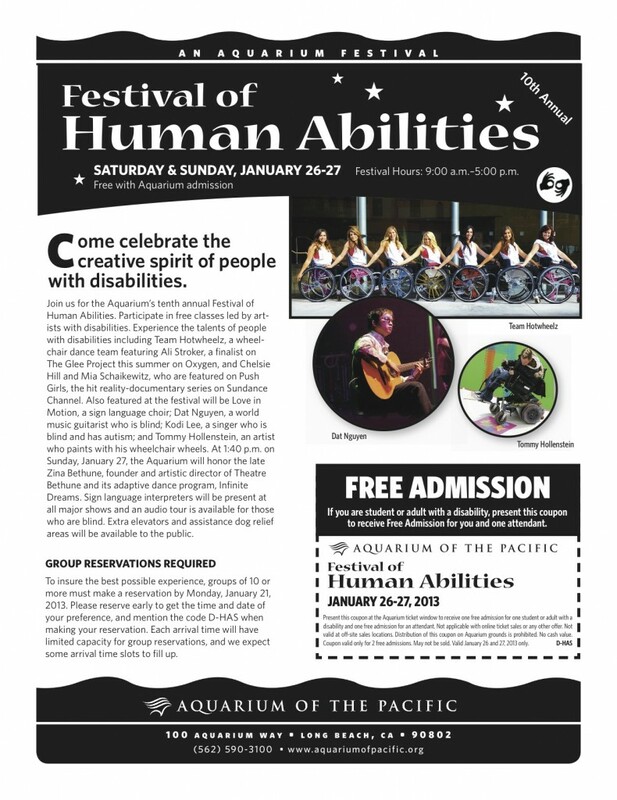 I wanted to share that Shark Lagoon Nights are back at the Aquarium of the Pacific and also share about the Festival of Human abilities taking place this weekend, and offering free admission to disabled students and adults, along with 1 guest. Just click on the picture above to redeem your coupon. First up is Shark Lagoon Nights. They are back for the year and take place almost every Friday night (not taking place tonight because of the weather) from 6pm to 9pm. This free event allows you and the kiddos the opportunity to touch bamboo sharks, sandtigers and also rays in the Aquarium’s Shark Lagoon. Also the Festival of human abilities is taking place this weekend. The festival will take place this weekend and feature free classes with artists, and also experience the talents of those who are disabled. For additional info head here. This entry was posted in Uncategorized and tagged Aquarium of the Pacific, Aquarium of the Pacific Free, Free Shark Lagoon Nights, Human Abilities Festival. Our newest contributor, Kiersten, had the opportunity to take a Whale Watching Cruise with the Aquarium of the Pacific and shares all about it! Summer in Southern California is a glorious time. My kids are out of preschool which translates to almost daily adventures. 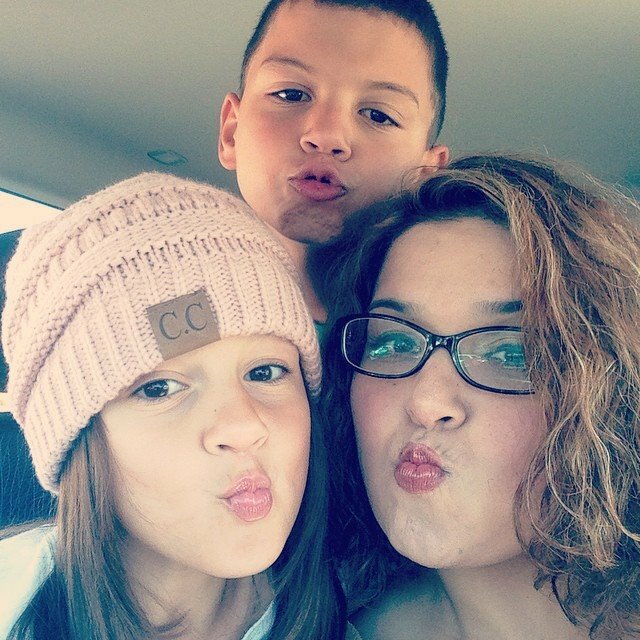 I don’t know about you but my kids and I get through our days so much happier if we spend the majority of our time out and about. This summer we have explored just about every museum, park, theater and arboretum LA has to offer. But as the weather heats up I tend to head toward the coast. The Aquarium of the Pacific in Long Beach has long been a favorite day trip for me and my kids. 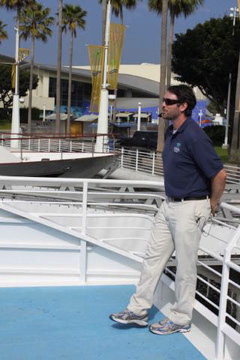 But the Aquarium recently got even better by partnering with Harbor Breeze Yacht Charters and Cruises. Summer in SoCal has long meant whale watching season. The giant beauties come to the waters off of the California coast to feed. But this joint venture now allows you to take a whale watching cruise led by a biologist from the Aquarium! 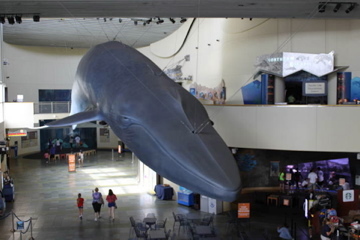 In addition to getting to search for whales, experts from the Aquarium’s blue whale research project inform you about the endangered blue whale population (as well as all of the other animals you encounter) and answer questions as you sail. Last week I had the opportunity to try out the new Blue Whale & Sea Life Cruise combo ticket with my son. The ticket is $59.95 for adults 12+, $54.95 for seniors 62+ and $38.95 for children and includes admission to the Aquarium as well as a 3 hour whale watching excursion (departing daily at 12pm & 3:30pm). We started our day off inside the Aquarium to check out the latest exhibit Whales: Voices in the Sea. This computer-based, interactive kiosk lets you hear whale vocalizations and try to emulate them. You (or your kids) can see how well you would be able to communicate with the whales (if you were able to vocalize loudly underwater). 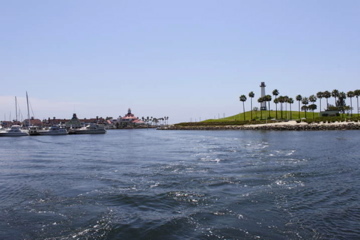 Then we headed out to Dock 2 on the harbor to board our double-deck sightseeing vessel. The boats are all U.S. Coast Guard inspected and have outside seating, a snack bar, restrooms as well as an inside dining area perfect for escaping from the wind for a bit. 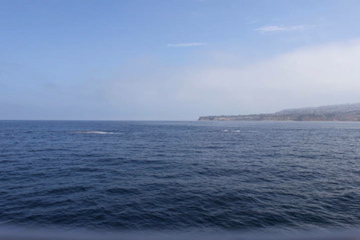 It took about an hour to cruise out to the waters off shore near Rancho Palos Verdes (and then an hour to get back). So I would recommend taking snacks (or lunch) and maybe some books from the library about the animals you are encountering. My 5 year old was mostly content to sit and look out to sea watching for whale spouts, but a few small activities would have made the excursion perfect. Along the way saw a humpback whale, dolphins, mola mola (ocean sunfish – one of the funniest looking creatures around), jellyfish and tons of birds. Our biologist guide was able to point out everything we were seeing and tell us about them. Having biologist David Bader on board really made the trip fantastic! We learned all sorts of neat facts about the blue whales we were visiting. The blue whale is the largest animal to ever live on earth (even bigger than the dinosaurs)! It is about the length of 3 school buses lined up end to end (we were on a 60 foot catamaran and the whales were bigger than us)! The blue whale’s tongue weighs more than an African elephant (the largest land animal currently alive). For all of you moms out there, the gestation period for the blue whale is 12 months and calves are about 25 feet long when they are born! They drink 100 – 150 gallons of milk a day for 6 months and gain upwards of 200 pounds each day!!! This was my very first time seeing live whales and it was absolutely magical. The captain was fantastic and was able to find us 5 whales over the course of our excursion. The best part was when we found a momma blue whale with her baby. The captain turned off the boat and they stayed with us for over 30 minutes. The whales were fascinated with us and circled around us several times. Sitting in the salon with my son we were able to watch the whales swim all the way around the boat twice! We had such an amazing time that I will definitely be heading back down with my daughter before school starts in a couple of weeks. Just remember your sweatshirts . . . it gets chilly out there! Combo tickets are available for purchase onsite or in advance by calling (562) 590-3100. Parking is $8 per car at the Aquarium parking lot. More information is available on the Aquarium’s website here. Disclosure: This is not a compensated post. Kiersten participated in a media whale watching tour to help facilitate the review. 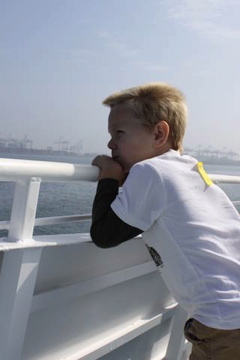 This entry was posted in Uncategorized and tagged Aquarium of the Pacific, blue whale watching, Long Beach, Whale Watching. One of my favorite Friday family events is back this Friday. 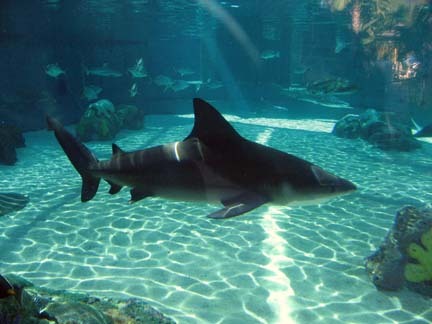 Shark Lagoon Nights take place on Fridays at the Aquarium of the Pacific in Long Beach from 6pm to 9pm. You will have the opportunity to touch bamboo sharks and see large sharks such as sandtigers as well as rays in the Aquarium’s Shark Lagoon. It’s a fun little family outing on Friday night. The only thing you have to pay for is parking. Cash only. If you are in the area make sure to stop by on a Friday night. It’s a super fun little adventure. This entry was posted in Uncategorized and tagged Aquarium of the Pacific, Long Beach aquarium, Shark Lagoon Nights at the Aquarium of the Pacific.